Ahead of Conceptual Art in Britain 1964–1979 at Tate Britain, we round up the top artists and works featured in the show. 1. Conceptual art was a ballsy backlash to modern art. Conceptual art was born out of a rejection of everything art had become, from the conventional use of plinths in sculpture, to the rising price tags of modern art works. In the 1960s, artists from Europe, South America and North America began to reconsider what art could be and chose to value the ideas behind the works over sophisticated materials and skilled practises. Keith Arnatt was a key conceptual artist. His work Art as an Act of Retraction (1971) explores creation as an act of retraction, or taking something back. The work consists of 11 black and white photographs of the artist himself about to eat a different scrap of paper, each scrap with a different word printed on it. A twelth panel lists the printed words: ‘eleven portraits of the artist about to eat his own words’. 2. See everyday objects as works of art. From cassette tape recordings in David Tremlett’s The Spring Recordings (1972) to the glass of water in Michael Craig-Martin’s An Oak Tree (1973), conceptual art took the form of just about anything. In Their Grassy Places (1969) Bruce McLean bought the syndication rights of two newspaper stories from the Daily Mirror, exhibited them as he’d found them in the pages of the art magazine, Studio International, then attempted to sell the stories back to the Daily Mirror, this time as art. Unsurprisingly, the Daily Mirror declined. 3. Take a piece of art home. In 1967, Roelouf Louw exhibited Soul City (Pyramid of Oranges) in London. Approximately 5800 oranges were stacked in a pyramid and instead of allowing the fruit to rot, Louw invited visitors to eat the oranges. Incidentally, the work took on a whole new meaning as viewers removed oranges and changed the work’s original form. The way the viewers engaged with the piece also changed, as the piece ultimately became about the choice of taking an orange or not taking an orange. Louw’s sculpture will be recreated in the show, giving you the chance to take, or not take, an orange. 4. Conceptual art works were created and displayed beyond gallery walls. Many conceptual artists rejected the usual ‘white cube’ gallery setting in a big way. Works were created and exhibited on the street, in fields and even on buses; the focus became about the world the works existed and acted within. 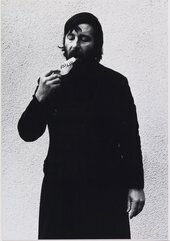 Braco Dimitrijević’s The Casual Passer-By I Met at 11.28am (1972) consists of a photograph of a man that Dimitrijević took outside St Martin’s School of Art, where the artist studied at the time. Dimitrijević displayed posters of the headshot on the back of the no.14 buses, which ran past the College, committing the work into the public realm. Now, the work exists as a document which includes the headshot, a signed declaration stating that the man in the shot did meet Dimitrijević at 11:28am in October 1972 and two photographs of the posters on the back of the bus. 5. Conceptual artists paved the way for the likes of Martin Creed and Damien Hirst. Though initially scolded by the British Art Establishment, conceptual artists changed the way we see art today. Their relentless experimentation and deconstruction of the age-old principles of art have inspired and informed many of the best known artists of today, from Simon Starling to Martin Creed and Damien Hirst. Book tickets for Conceptual Art in Britain 1964–1979.